When people you know, think money, do they think "you"? Everybody you know – is different. Some are Family & Friends. Others are Past Clients, or Potential Clients. And others are your COI – Circle of Influence. KiTS publishes to each of your Contacts based on how you know them. And they live in different home-types. Some live in Freehold homes. And some in Condo Townhomes. Yet, others are in a Rental. each and every one different - tailored to how you know them, and where they live . 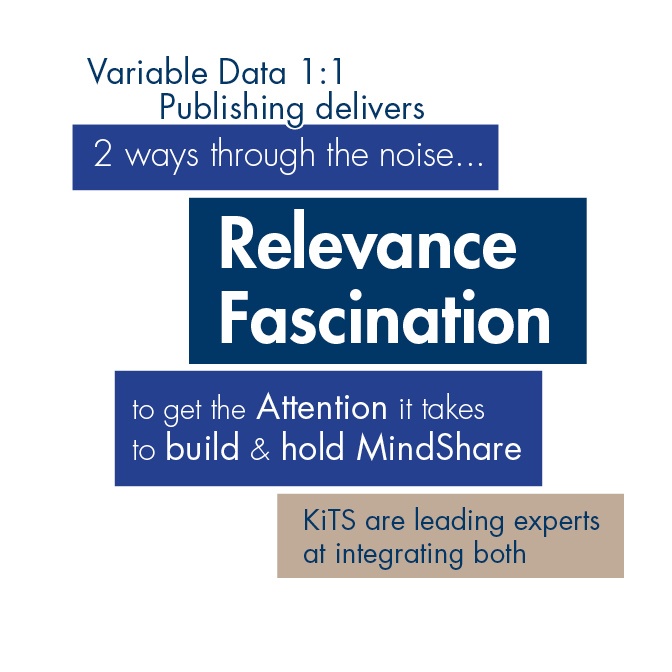 Customized, personalized marketing with relevance. A CRM system should grow your business, not occupy your time. 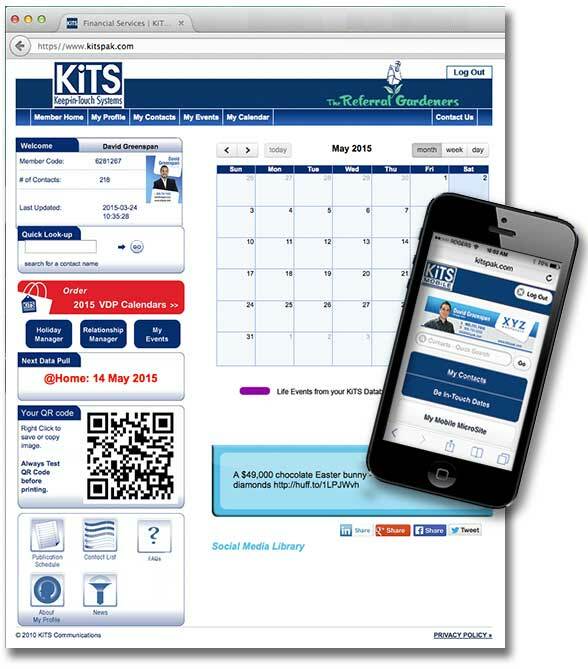 KiTSPak.com, connects you to your Contacts, PLUS a Communications & Variable Data print marketing system that keeps you front & centre. And with the SmartPhone Web-App included, it’s great on-the-go. Track complete Client Mortgage Details including renewal reminders, across multiple properties or portfolios. What: QR Code – Quick Links SmartPhones to you! 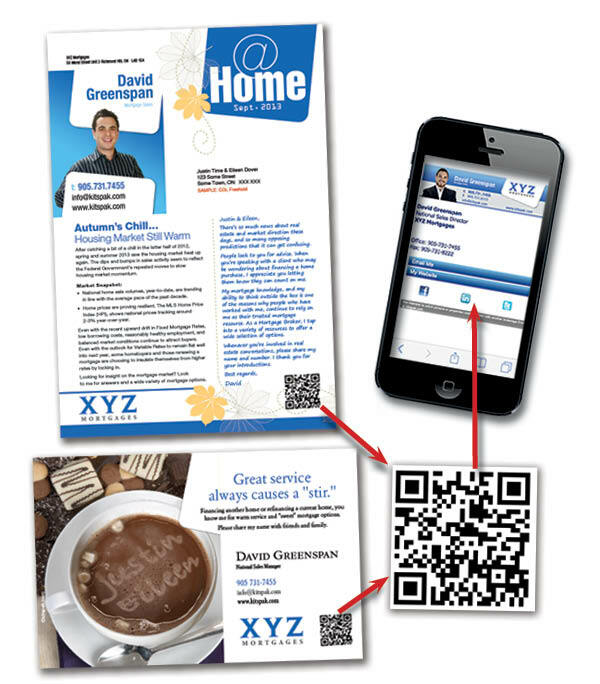 Your KiTS marketing suite includes your own QR code. Prospects - the people who know you, like you, trust you. By the type of home. By how you know them. 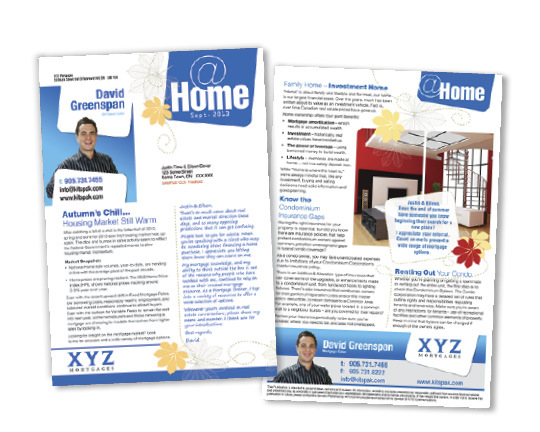 A different newsletter for every Contact. • Smart topics – Up-to-date articles and clever graphics. – to the interests of your audience. • Postage Stamped mail gets attention. • Easy & Automated – KiTS does it all for you! Research. Writing. Design. Printing. Folding. Inserting. We lick the Envelope & stick the Stamp. And even deliver to Canada Post, for you! 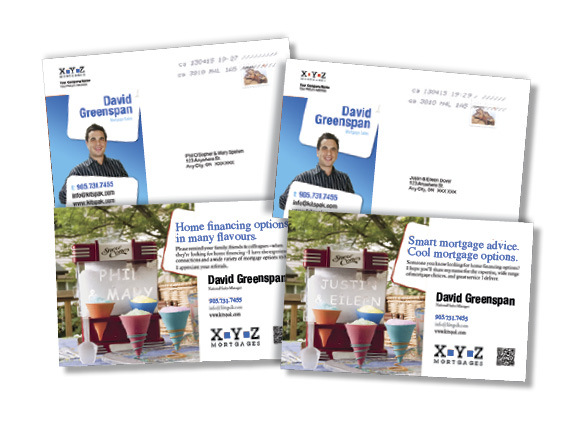 What: Variable Data Personalized Postcards. Prospects – the people who know you, like you, trust you. to build & maintain mindshare. • ‘WOW’ Personalized to them – Relevant to how you know them. • Smart graphics – to capture attention. • Stamped mail gets attention. 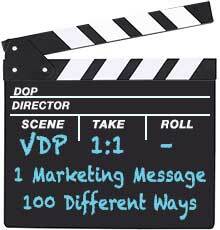 • Fast to Market – From data-pull, to in-mail time. then, personalized to each Contact. Why: Calendars have become ho-hum. 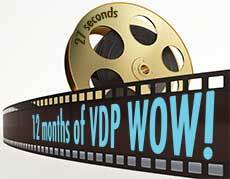 KiTS VDP calendars Grab BIG attention. 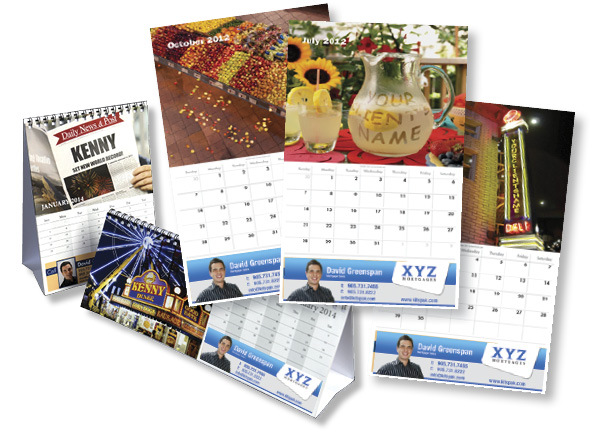 Customized to You – KiTS VDP Calendars feature your photo, your brand, your contact information on every page. KiTS is “the” calendar that hangs around ALL year. It’s a keeper! • Your Contact’s name is personalized right into each image. • You pick who gets one... KiTS does the rest. • Choice of format & size.